On this Mother’s day weekend, Soprano Sérine de Labaume and Pianist Elena Kim invite you to rediscover pieces of French Operas. Among these pieces, you will have the pleasure of hearing Gounod’s Jewel Song, Massenet’s Gavotte, Delibes’ Bell Song or Offenbach’s Doll Song. Using a remarkably varied vocal register but also amusing theatrics, Sérine de Labaume communicates perfectly the emotions of her characters. This enthusiastic duo delights us : more than a musical performance, this recital is a real show with fantasy, theatre and comedy. Who said Opera was boring or formal? Come and see for yourself ! It’s surprising, funny and vibrant ! 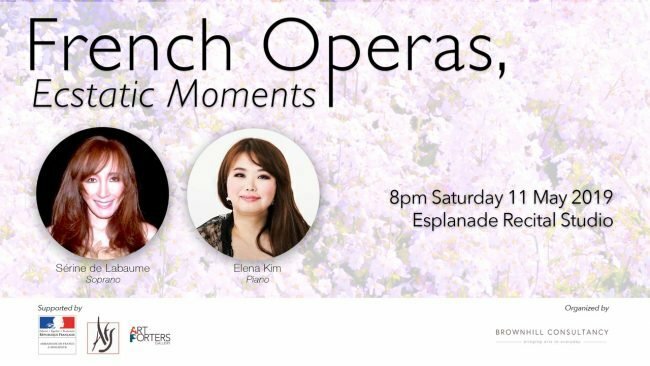 French Operas, Ecstatic Moments will be staged at Esplanade Recital Studio on 11th May 2019 at 8 pm. For all mothers, a little surprise awaits you at the end of the recital.